waters, a boat ride, a camping spot, a tour of an old fort, or a place to fish." And that's why we found ourselves on a day drive to explore part of these beautiful barrier islands south and east of Pensacola, Florida. On a sunny, breezy, gorgeous, billowy-white-cloud day at the end of March, what could be more enjoyable than viewing white sandy beaches and clear, turquoise blue water as far as the eye can see? Yep. 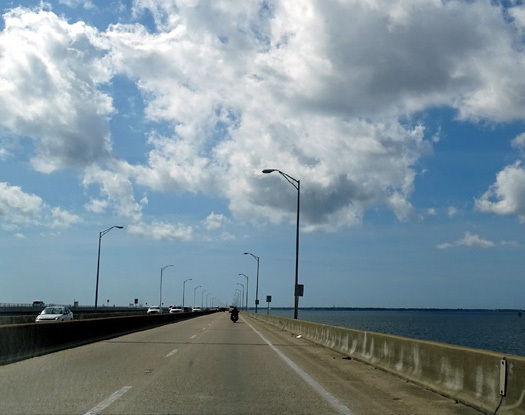 I just dated this entry at the end of April to follow the others in my series on the five weeks we spent in the Pensacola area. This day trip was actually March 31, when it was a bit cooler (upper 70s F.) than late April but I imagine it would be enjoyable any pretty day of the year. Whew! It sounds long, but it was only about 70 miles from our campground and back. Before we got out of the car another couple drove up with two dogs. One was part chocolate Lab, so we decided to stay for a little while. "A little while" turned into about an hour. We enjoyed talking with this couple, also federal retirees, who are snowbirding in Pensacola until the snow melts at their home in the Upper Peninsula of Michigan. Smart folks! They want to get an RV so they had lots of questions about the lifestyle and how to change state residency. 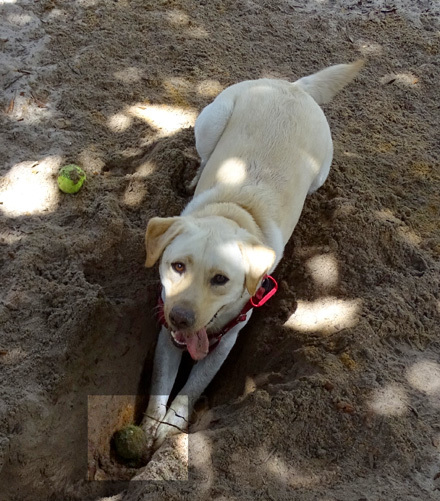 Casey, lower right, guards the hole she dug and the two tennis balls (highlighted) she found in the park. 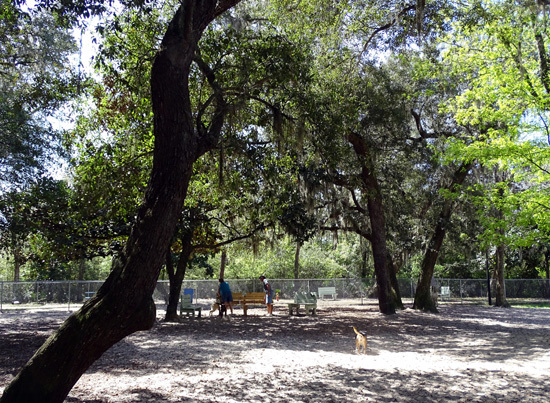 The couple told us about several other folks who routinely bring their dogs to the park between 11-1 each day. Soon two more people brought dogs. They all got along great. Casey spent most of the time digging deep holes in the soft sand near us -- usually with a ball in her mouth -- instead of playing with the other dogs or chasing balls we threw. That's odd for her but she had a great time and was a source of amusement for the other dog owners. One pooped pup, lying in her hole to cool off. She's still got two tennis balls nearby. Although we passed lots of lovely white sand beaches we didn't take the dogs to the water. Most of the beaches in Florida prohibit animals. We did pass two dog beaches that day but we didn't want to hassle with sand in the car and having to wash the dogs when we got home. Gulf Breeze had some pretty homes but we were completely turned off by all the businesses and high-rise hotels, condos, and apartments in Pensacola Beach. Too much pretension, too many people, too few unobstructed views of the beach and water. We were much happier when we reached the boundary of the national seashore, which was beautiful, serene, and relatively uncrowded on a weekday. 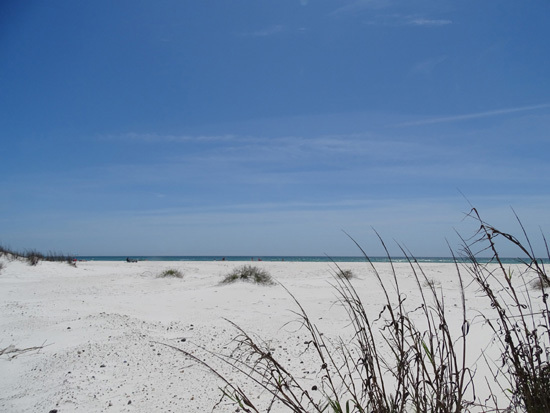 Gulf Islands National Seashore stretches for 160 miles along the coast of Mississippi and Florida and includes barrier islands and salt marshes. Some of the islands can be accessed by car, others only by boat. You can see at map of the park on this web page. 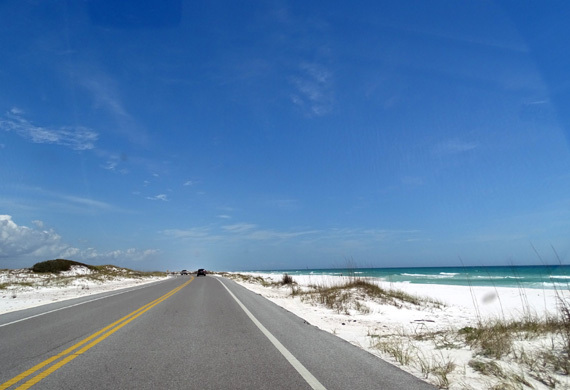 We drove only the part of the seashore on Santa Rosa Island in Florida between Fort Pickens to Navarre Beach, about ten of the eighteen miles of FL399. Boardwalks protect fragile dunes from damage. 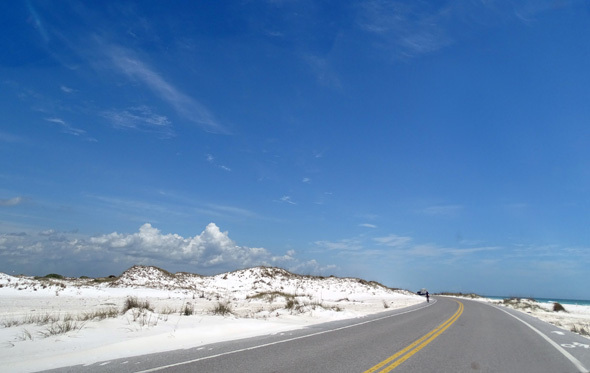 Popular activities are swimming, beach combing, boating, fishing, hiking, cycling, camping (primitive or developed), birding and watching other wildlife, photography, touring Fort Pickens, and scenic driving like we did. Since we'd already seen Fort Barrancas, the Spanish Water Battery, and the Advanced Redoubt at NAS Pensacola, also part of the national seashore, we didn't tour Fort Pickens that day. It was also too hot to leave the dogs in the car for more than a couple minutes. 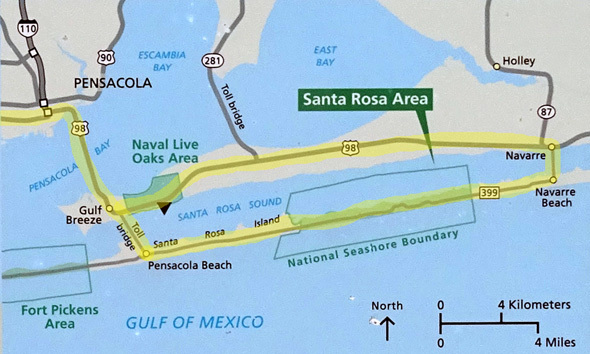 As a national park, there is a fee to enter Gulf Islands National Seashore unless you already have one of the annual passes. 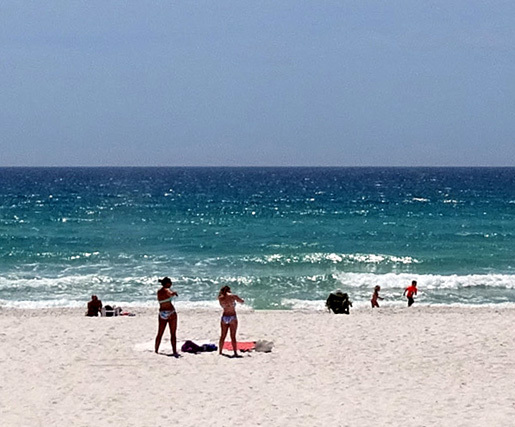 Even if you just drive across Santa Rosa Island from Pensacola Beach to Navarre Beach, like we did, and don't do any outdoor activities, the fee is worth it. I loved viewing the beautiful white sand beaches and dunes, which reminded me of White Sands National Monument in New Mexico -- only with the added bonus of beautiful aquamarine-colored ocean water! 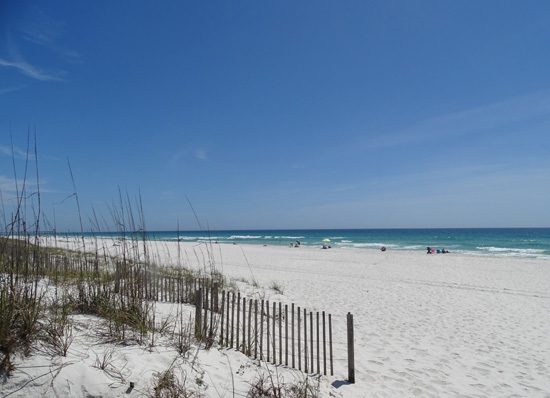 According to the park website, the stunning sugar white beaches of Gulf Islands National Seashore are composed of fine quartz eroded from granite in the Appalachian Mountains. The sand is carried seaward by rivers and creeks and deposited by currents along the shore. It is fine and soft, perfect for walking barefooted along the shore. 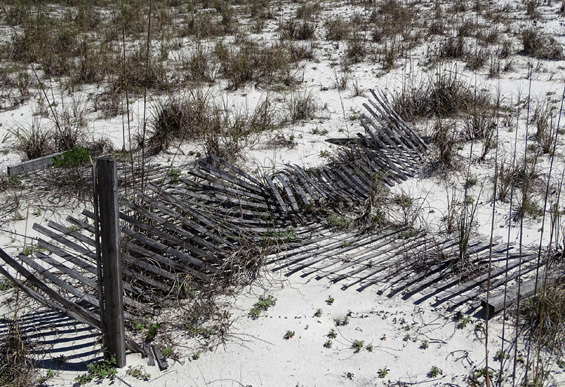 In Florida pets are not allowed on most beaches, including this national seashore. They can only walk along roadways and multi-use paths in the park. 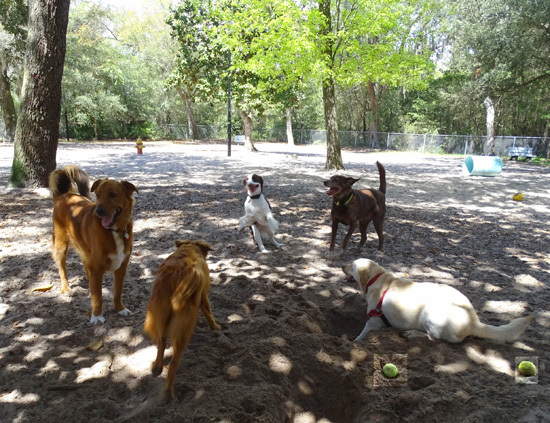 We let them out several times to sniff and pee at parking areas along the beach but they couldn't walk out on the sand with us. Because of the heat Jim and I didn't take any walks more than a couple hundred feet from our car, enough to take the photos in this entry. We enjoyed this tour of the national seashore and recommend it to others who are in the area. Even a "drive-by" like ours was fun. It'd be even more fun to hike and bike and swim there . 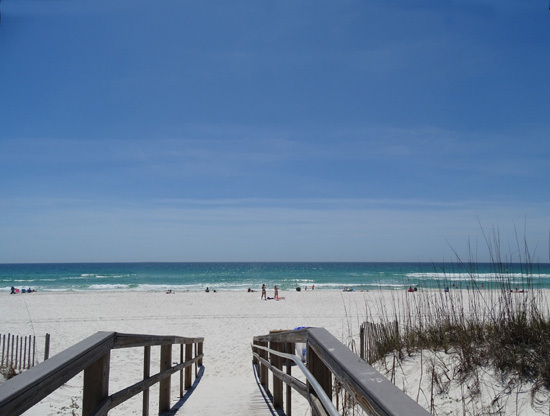 . .
We have also enjoyed spending five weeks in the Pensacola area. We'd like to come back here again in the winter or spring. 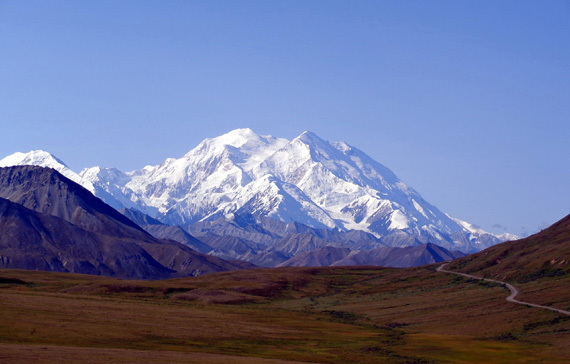 Today we've been preparing to travel to our next destination, the USAF Academy campground in Colorado Springs, the next step on our way to Alaska for the summer. We'll leave in the morning and spend four or five days on the road, hopefully dodging some predicted nasty weather along our route. The weather has been so volatile in Texas this spring that we changed our minds about spending the month of May in Austin and will go to Colorado instead.